WINDWARD 17 was designed for Richard Elton of Mt Pleasant, SC. 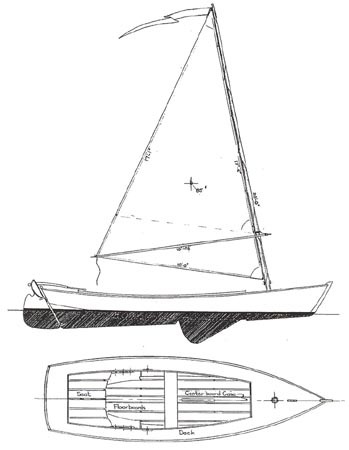 He wanted a longer version of the successful Windward 15 with a larger cockpit (2 ft) and more sail area. She has very graceful lines. She is fast with modest sail area, has camp cruising capabilities under a boom tent, and has a stable chine hull. The sprit boom is very easy to handle on all points of sail. Her graceful lines make her a pleasure to build and sail. See Boat Design Quarterly (No. 2) for a design review. Construction is 3/8" plywood and epoxy over straight frames. 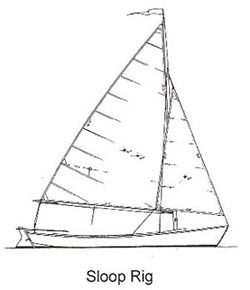 Plans include: materials, lines, construction, and a sail plan. A full size frame plan is available. Estimated cost for quality construction materials (not including sails) is $7000. This cost includes a high level of outfit and finish you can be proud of after putting the effort into building this fine boat. Purchase and Download Study Plans for the WINDWARD 17 for $5.00 in PDF format (zipped file). Purchase Construction Plans for the WINDWARD 17 for $85.00 for delivery by US Postal Service. Purchase Full Size Frame Lofting for the WINDWARD 17 for $85.00 for delivery by US Postal Service.